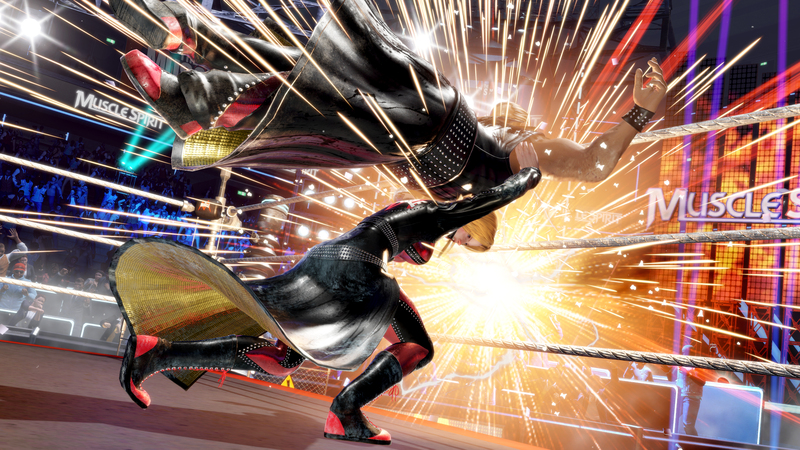 At a Koei Tecmo event last week, I was able to sit down and run some sets in Dead or Alive 6, and spend some time chatting with the game’s director, Yohei Shimbori. This was a much more packed build of Dead or Alive 6 compared to what we saw at E3, featuring several characters, an arcade mode, and a handful of stages. From my time with the game, playing with others at the event and by myself, not only am I excited to play it more as a general fan of fighting games, but I think long-term fans of the series will also have a blast throwing down with all the returning characters, and newbies such as Diego. If you’re a fan of other fighters such as Street Fighter or Tekken, and haven’t played Dead or Alive, know that this game has hooks all of its own. It’s fast, and has trademarks of 3D fighters such as side-stepping and some juggling, but what stands out to me the most is a big emphasis on defense and elaborate, meaty animations. It also doesn’t shy away from intruding in the fighting with silliness, with several different kinds of stage hazards, and elaborate transitions as well. New to Dead or Alive 6, aside from a totally new engine, is the Special button. This, as Shimbori told me, is based on a targeted approach to accessibility. While Dead or Alive 6 is still a complex, nuanced, fighting game, Shimbori and his team also wanted to make it possible to play the game, at some level, with one button if necessary. Using the Special button gives access to Fatal Rush, which is a small auto-combo reminiscent of other recent fighters, but it also combines with another new features, the Break Gauge. The Break Gauge brings meter management to Dead or Alive for the first time, and opens up for some special techniques and/or comeback mechanics. Combined with the Fatal Rush, using the Special button with enough meter will also lead to a super move, all of which are painstakingly animated. There are also the Break Blow and Break Hold techniques, which burn meter to help you get out of a bad spot or add some extra oomph to a well-timed counter. As I felt things out, what immediately stood out is how careful you have to play to do well. In Dead or Alive, it’s almost always possible to get out of a bad situation. Mashing on buttons, even when you seem to be at an advantage, can lead to a counter. Those animations from earlier, while super impressive to see in action, also mean there is more time than you may expect between pressing a button and the impact of your move. Meanwhile, defending, or “breaking,” is a four-way affair. All this means that you can’t hammer on your controller and expect Dead or Alive 6 to forgive you for it. Much like Team Ninja’s renowned Ninja Gaiden series, Dead or Alive feels like a game of carefully creating openings for yourself, and capitalizing as much as you can in a short window of time. Almost like a real, professional fight, in terms of tempo. As much fun as I was having, Dead or Alive also has its somewhat controversial reputation, and there was a particular baggage of sorts hanging over Dead or Alive 6 at this event. When the game was announced, there were early reports that Dead or Alive 6 was a more “serious” game, and that its history of objectification and bizarre “jiggle” physics may be on the way out. The reality of the situation is that this was largely a misunderstanding, albeit with a few points of context. When I asked him about the situation, Shimbori did speak to earlier reporting on Dead or Alive 6, and (through his interpreter) seemed to agree it was a misunderstanding. He did say that there is a particular mood the team intends for Dead or Alive 6 to express, “Intense Entertainment.” Through that and some of the talk of things like battle damage, of which there is a lot in Dead or Alive 6, the message that the game is meant to be more “serious” began to spread despite being mostly inaccurate. It’s worth noting that many of the characters seem to have alternate costumes right out of the box (or at least did so in the preview build), and some of those outfits were a bit more on the conservative style. However, the classic Dead or Alive “experience,” if you will, appears intact. Of course, in terms of the game’s overall tone, you can look no further than the stage hazards and transitions to know that Dead or Alive 6 still very much has a sense of humor, from literal dinosaurs getting involved in fights, to a kraken rising from the sea and smashing your opponent into the lower quarters of a ship, where explosives are mixed in with the treasures. I also asked Shimbori about the rise of mainstream prominence of women in combat sports in recent years, and how (if at all) that has impacted Dead or Alive 6. At this point I really wished I could speak Japanese, as Shimbori started talking about how dope Asuka (of WWE fame) is, and I wanted to take the chance to mark out with him. Sadly, all I can do is report here that Shimbori is totally an Asuka mark, and deserves the appropriate respect. Anyway, he talked about how women in Dead or Alive have always been strong, but that as women involved in combat sports have found opportunities to be taken more seriously on that broad level (again, using the WWE as a prime example), the hope here is that reflects into an opportunity for the game’s cast to stand out more as well. When Dead or Alive 6 drops on February 15, 2019, it will be arriving in the face of a lot of competition. I think Shimbori, Team Ninja, and Koei Tecmo are aware of that, and that’s why there seems to be a lot of muscle behind this one. The visuals and animations are top-notch, with the extra layer of detail from the battle damage making it that much more impressive. Meanwhile, the roster is only growing, and as we saw with the latest “Muscle” reveal, additions are being treated like a big deal. Finally, the new Break Gauge adds a level of familiar theatricality to Dead or Alive’s more contemplative mechanics. If “Intense Entertainment” is the goal here, then Dead or Alive 6 is poised to deliver.